The sixth generation of the Mercedes-Benz SL550 roadster is being launched in 2012, 60 years after the first SL model debuted, with an all-new aluminum unit body, with torsional rigidity that's 20 percent stiffer than the previous-generation steel body. The SL550 coupe (pictured above) is powered by a new 429 horsepower 4.6-liter V8 engine with direct fuel injection, twin turbochargers and multi-spark ignition mated to a 7 speed automatic transmission. The engine has 20 percent smaller displacement but generates more horsepower and torque than the previous generation. A pair of paddles strategically positioned behind the upper steering-wheel spokes allows you to manually upshift and downshift the 7-speed automatic transmission with just a flick of your fingers. MSRP is $106,405 (including $905 transportation charge). The new SL550 engine comes with an ECO stop-start system. Whenever the car stops with the brake pedal depressed, the engine is automatically turned off to save fuel. As soon as the driver touches the accelerator pedal, the engine computer selects the piston that is in the best position for first ignition, and the direct fuel injection and multi-spark systems work with a starter motor to seamlessly re-start the engine. At the push of a button, the roof is opened or closed in less than 20 seconds. During this transformation, an intelligent tilting mechanism ensures that the roof and rear window "spoon" and retract into the top section of the trunk to preserve a good deal of useful trunk space. Nissan's recently introduced all-new global sedan will be the basis for an all-new 2013 Nissan Sentra to be unveiled in the United States later this summer for a Fall on-sale date. Sentra will hits showrooms after the summer sales introductions of all-new Altima and all-new Pathfinder. The all-new 2013 Sentra will be launched as the nameplate celebrates its 30th anniversary in the U.S.
Sentra is Nissan's second best selling vehicle behind the Altima so far this year. The all-new 2013 Acura ILX will go on sale on May 22 with a manufacturer's suggested retail price starting at $26,795 (including destination charge of $895) for the entry-level ILX powered by a 150 horsepower 2.0-liter inline 4-cylinder engine paired with a Sequential SportShift 5-speed automatic transmission. The 2013 Acura ILX with a 201 horsepower 2.4-liter engine featuring a close-ratio, six-speed manual transmission starts at $30,095 (including destination charge of $895) with the Premium Package. The ILX Hybrid with a 1.5-liter inline engine and an Integrated Motor Assist® electric motor starts at $29795 (including destination charge of $895). Paired with a Continuously Variable Transmission (CVT), the ILX 1.5L Hybrid has an EPA estimated city/highway/combined fuel economy rating of 39/38/38 mpg. The Premium Package (available as a $3,300 option; not available on the ILX Hybrid model) features leather seating surfaces, heated front seats, a power driver's seat, an upgraded 360 watt stereo system with XM® radio, HID headlights, foglights, 17-inch aluminium wheels, a multi-view rearview camera and an Active Sound Cancellation system to make for a quieter cabin. The Technology Package (available on the ILX with 2.0-liter engine for $2,200) adds Acura's ELS Surround® audio system and AcuraLink® Satellite Communication System, Acura Navigation System with Voice Recognition™, AcuraLink Real-Time Traffic with Traffic Rerouting™, AcuraLink Real-Time Weather™ with radar image maps and HomeLink®. The navigation system makes use of a hard disk drive (HDD) with 60 gigabytes of storage capacity— including 15 gigabytes that can be specifically allocated for music storage. The Technology package is also available on the ILX Hybrid for $5,500 and includes all Premium Package features except 17-inch aluminium wheels. Ford Motor Company will build a new state-of-the-art assembly plant in Hangzhou, China, investing US $760 million with its joint venture with Changan Ford Mazda Automobile doubling its production capacity in China to 1.2 million passenger cars annually by 2015. It brings Ford’s total investment in China to approximately US $4.9 billion since 2006. The Hangzhou plant announcement comes just two weeks after Ford said it will invest US $600 million to expand capacity at its Chongqing facilities by 350,000 passenger cars, and less than six weeks after the company opened Chongqing 2, the home of the New Focus, which increased its China passenger car capacity by one-third to 600,000 units. Construction of the new plant in Hangzhou will begin later this year, with the first vehicle coming off the line in 2015. 2013 Chevrolet Silverado HD and GMC Sierra 2500 HD extended cab heavy-duty pickup trucks will have a bi-fuel option for $11,000 above the suggested base-vehicle price and you can order them now. The pickups, which run on compressed natural gas (CNG) and gasoline, have a Vortec 6.0L V8 engine that seamlessly transitions between the two fuel systems. A single light-weight Type 3 tank in the bed maximizes available payload and bed space, offering more usable space than competitors. The Silverado HD and Sierra 2500 HD offer customers fueling flexibility with a combined CNG and gasoline range of more than 650 miles. The all-new Cadillac XTS luxury sedan will be built in China in conjunction with joint venture partner Shanghai General Motors beginning this Fall. The new 2013 Cadillac XTS launches in North America later this spring with production beginning in the coming weeks at the Oshawa, Ontario Assembly Plant. China is the second-largest market for Cadillac with record sales of 30,000 vehicles in 2011, compared with 17,000 in 2010. The SLS Executive Sedan, an extended-length luxury car exclusive to China has been built in China since 2006. All of Cadillac’s core product lines are sold in China, with the CTS Sedan and Coupe, SRX crossover and Escalade imported from North America. The SRX is Cadillac’s top seller in China with the average age of a Cadillac buyer in China at 35 years old. In March Cadillac sales set a monthly record of 2,745, an increase of 35.2% over the same period in 2011. Money101 on KFWB NewsTalk980 - Bob McCormick and Richard Saxton. The all-new 2013 Mercedes-Benz GL-Class goes on sale in the U.S. in September 2012 with three models: 2013 GL350 BlueTEC has a re-engineered 240 horsepower V6 diesel engine, the 2013 GL450 has a 362 horsepower twin-turbo direct-injection V8 engine and the 2013 GL550 has a direct-injection twin-turbo 429 horsepower engine, all with more horsepower than their predecesors. In addition to 4MATIC permanent all-wheel drive, standard equipment includes a hill start assistant, and Downhill Speed Regulation). Standard equipment also includes COLLISION PREVENTION ASSIST and ATTENTION ASSIST driver drowsiness detection. The radar-based COLLISION PREVENTION ASSIST operates at speeds between 20 and 155 mph and recognizes when the distance to the vehicle in front is decreasing. It can also recognize stationary objects. If there is an imminent risk of a collision, the system emits a visual and acoustic warning to alert the driver and prepares Brake Assist for the most immediate possible braking response, which is initiated as soon as the driver applies the brakes. A new option is the Power EASY-ENTRY system for access to the third seat row. The Parking Assist package for the GL350 BlueTEC and GL450 features PARKTRONIC with Active Parking Assist for automatic maneuvering in and out of parallel parking spots, plus the new surround view camera which uses image data from four cameras at the front and rear of the vehicle and in the exterior mirror casings to calculate a bird's eye view of the vehicle and its surroundings, and shows this and other perspectives on the large COMAND display. The On- and Off-Road package, available as an option for the GL450 and GL550, enhances handling and safety with six programs, delivering optimum driveline control across the most diverse conditions on the road and on rugged terrain. The 2012 BMW M6 Convertible arrives this June and will be priced at $113,995 (including $895 Destination and Handling). The 2012 BMW X6 M that arrives in May will sell for $93,795 (including destination and handling). The 2013 BMW M5 and 2013 BMW M6 Coupe powered by a 560 horsepower M TwinPower Turbo V-8 mated to a high torque 7-speed M-Double Clutch transmission will arrive in late summer and will carry Manufacturer’s Suggested Retail Prices of $90,695 on the M5 and $106,995 on the M6 (including destination and handling). The 2013 640i Gran Coupe powered by a 3.0 liter TwinPower Turbo Inline-6 engine goes on sale in late June with an M.S.R.P. of $76,895. Later in the summer, the TwinPower Turbo V-8 powered 2013 BMW 650i Gran Coupe at $87,395 and the all-wheel drive 2013 BMW 650i xDrive Gran Coupe at $90,395 will join the line up. The 2013 BMW X1 sDrive28i rear-wheel drive model will be powered by a 240 horsepower 4-cylinder TwinPower Turbo engine starting at $31,545 (including $895 Destination and Handling) with the all-wheel drive X1 xDrive28i having the same engine and starting at $33,245. 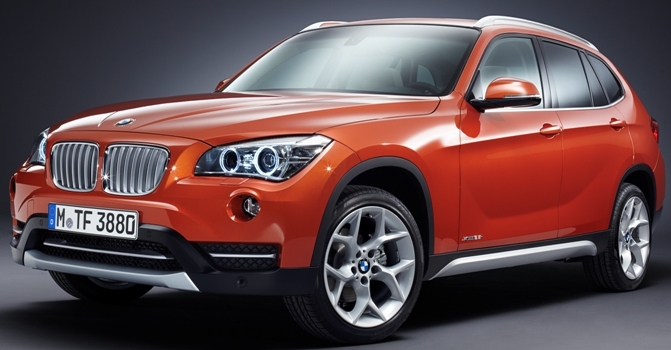 The 2013 BMW X1 all-wheel-drive xDrive35i will have a 300 horsepower 6-cylinder inline TwinPower Turbo engine starting at $39,345. Both engines are paired to an automatic transmission and BMW EfficientDynamics technology which consists of twin-scroll turbocharging, High Precision Direct Petrol Injection, VALVETRONIC variable valve timing and Double-Vanos variable camshaft control. The intelligent all-wheel drive of the BMW X1 xDrive35i and BMW X1 xDrive28i varies the distribution of drive between the front and rear wheels, as required ensuring optimum traction and directional stability in all weather and road conditions, as well as noticeably sportier responses through dynamically taken corners. Features including the Auto Start-Stop function (28i only), Brake Energy Regeneration and demand-based operation of ancillary units all help to achieve a blend of performance and fuel economy. I'll be racing to a BMW dealer to check it out this Fall. The all-new 2013 Dodge Dart starts at an MSRP of $16,790 (including the $795 destination) for the SE trim powered by the new 160 horsepower 2.0-liter 16-valve Tigershark I-4 engine. The SXT trim level starts at $18,790, the Rallye starts at $19,790 and the Limited at $20,790. All will be on sale in June except the $23,290 R/T powered by the new 184 horsepower 2.4-liter Tigershark MultiAir 2 4-cylinder that will be available in the 3rd quarter of this year. The third-generation 2013 Hyundai Santa Fe crossover family introduces the two-row, five-passenger Santa Fe Sport (pictured above) and the long wheelbase (LWB) three-row, seven-passenger model called Santa Fe with the Sport will go on-sale late this summer and the larger Santa Fe in January 2013. Santa Fe Sport will either a 190 horsepower 2.4-liter Gasoline Direct Engine engine with estimated fuel economy of 23 city and 33 highway or a turbocharged 2.0-liter GDI engine with an estimated 264 horsepower. The top-of-line LWB Santa Fe is powered by the 290 horsepower 3.3-liter V6 engine, which is also in the Hyundai Azera. The 2013 Santa Fe models feature Hyundai’s Hillstart Assist Control (HAC) and Downhill Brake Control (DBC) to maximize control on steep hills. HAC minimizes rolling backwards on steep ascents while DBC helps the driver maintain vehicle control and speed on steep downhill descents. The LWB three-row Santa Fe offers Hyundai’s first Blindspot Detection System (BDS). This system identifies when a vehicle enters the defined blindspot and provides a warning that a vehicle is approaching. 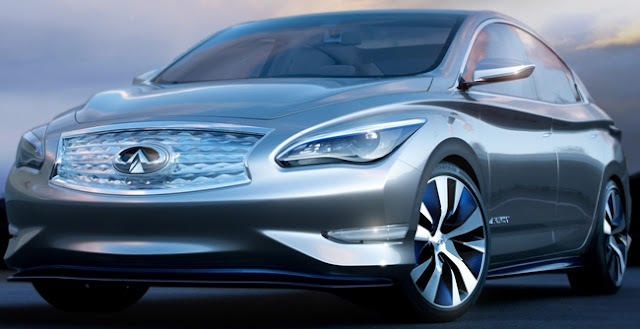 Infiniti LE Concept is expected to reach Infiniti showrooms in near-similar form as a production version within the next two years as Infiniti’s first zero emission luxury sedan. Torque of 240 lb-ft is instantly available immediately at all times. The Infiniti LE Concept’s battery system is a proven laminated 24 kWh lithium-ion (Li-ion) design with a ChaDeMo DC50kW quick charger.The Infiniti LE Concept’s efficient EV platform maximizes interior space by placing the batteries under the passenger compartment floor. This positioning helps provide a low vehicle center of gravity for enhanced handling and maximizes trunk room, without compromising front or rear seat passenger legroom or comfort. 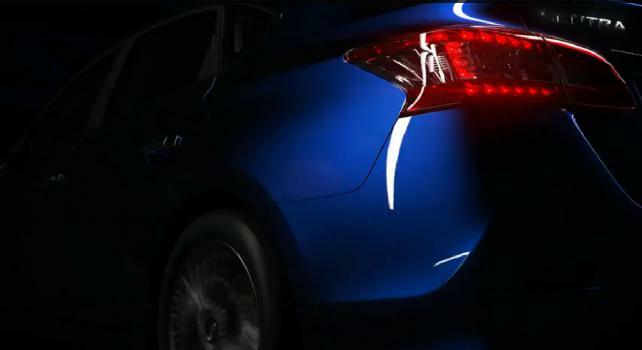 The all-new fifth new-generation 2013 Nissan Altima Sedan will start at $21,500 with an estimated fuel economy of 38 mpg when it goes on sale beginning in July. The all-new Altima Sedan has seven models – the 2.5, 2.5 S, 2.5 SV and 2.5 SL featuring a 182-horsepower (est.) 2.5-liter inline 4-cylinder and the 3.5 S, 3.5 SV and 3.5 SL with a standard 270-horsepower (est.) 3.5-liter V6 engine. 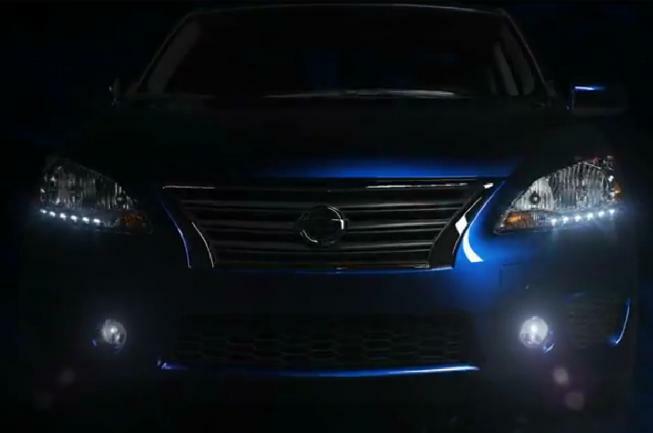 Every 2013 Altima is equipped with a standard next-gen Xtronic CVT® (Continuously Variable Transmission). The new Altima also offers standard NissanConnect integrated smartphone connectivity with standard Bluetooth® Hands-Free Phone System, Streaming Audio via Bluetooth®, and available Hands-Free Text Messaging Assistant, Pandora®, real-time POIs Powered by Google®, Google® Send-to-car, Easy Fill Tire Alert, and next-generation Safety Shield Technologies, including Blind Spot Warning (BSW), Lane Departure Warning (LDW) and Moving Object Detection (MOD) systems. The all-new 2013 Toyota Avalon premium mid-size sedan offers three drive modes - Normal, Eco, and Sport. In Sport mode, throttle response is enhanced and steering effort is weighted from center to offer a sportier character. Eco changes throttle response and A/C power usage to help improve fuel economy. Steering-wheel mounted paddle shifters help provide a sportier drive while in the D or S Mode, where the revised throttle helps improve shift response to help maximize engine power and vehicle performance. Like all Toyota models, the new Avalon will feature Toyota's Star Safety System™ standard, which includes Vehicle Stability Control (VSC), Traction Control (TRAC), Anti-lock Braking System (ABS), Electronic Brake-force Distribution (EBD), Brake Assist, and Smart Stop Technology brake-override system. A Pre-collision system is also available that is designed to "sense" an impending frontal collision and can help mitigate damage. A variable ratio brake pedal is adopted that varies the initial and final pedal effort ratios to help realize excellent brake pedal feel. In addition to a rearview monitor, Avalon offers an available Blind Spot Monitoring system which is designed to help detect vehicles behind the outer mirrors and to help alert drivers in addition to a new Rear Cross Traffic Alert system (RCTA) that can alert drivers of cross traffic when they are backing up. Expect to see the 2013 Avalon in showrooms late this year. Acura RLX hybrid sedan, slated for launch at the beginning of 2013, will have the all-new 3.5L direct-injected VTEC® V-6 engine and Sport Hybrid SH-AWD® system, with three electric motors, combining to generate more than 370-horsepower, and are paired with a 7-speed dual clutch transmission (DCT) and lightweight body to deliver V-8 acceleration with four-cylinder fuel economy—with an estimated EPA (city/highway/combined) rating of 30/30/30 mpg. Acura RLX employs an extraordinary array of new Acura technologies, including the Sport Hybrid SH-AWD® system, in combination with sophisticated styling and smart packaging to deliver an entirely new level of performance, sophistication and comfort. Safety features include a Collision Mitigation Braking System™ and the first application of Acura's Lane Keep Assist System. In addition, Forward Collision Warning and Lane Departure Warning will be offered as standard equipment on the RLX. The 2013 Honda Crosstour goes on sale this Fall with two powertrains including a re-engineered and more powerful 3.5-liter, 24-valve, SOHC, i-VTEC V-6 engine, or a 192 horsepower 2.4-liter i-VTEC inline four-cylinder engine. The 2013 Crosstour V-6 models will feature a 6-speed automatic transmission and utilize Honda Variable Cylinder Management™ (VCM®) technology to achieve an overall improvement in fuel economy compared to the outgoing model. Also available on Crosstour EX-L V-6 models is Honda’s Real Time 4WDTM system, which sends power to all four wheels when front-wheel slippage is detected. The next Crosstour will be available with Honda’s Lane Departure Warning (LDW) and Forward Collision Warning (FCW) technology. Both systems use a camera mounted behind the windshield to alert drivers if the car is moving out of its lane or to warn drivers of a potential collision in front of them. It will be one of the first models to receive the Honda-exclusive LaneWatch™ blind-spot display, which uses a camera system mounted on the passenger mirror for an enhanced view of the passenger-side roadway. Standard equipment to further enhance visibility on the 2013 Crosstour will also include re-shaped rear headrests, a rearview camera and an Expanded View Driver’s Mirror. The new 2013 Buick Enclave gets a new front fascia with LED daytime running lamps, new headlamp design with standard Xenon high-intensity discharge lamps (HID) and LED accent lighting, a new hood and black-chrome waterfall grille and a new rear fascia design with integrated exhaust outlets. The Enclave is offered in front-wheel-drive and all-wheel-drive models, and powered by a direct-injected 3.6L V-6 and an updated six-speed automatic transmission. Two systems available for the first time on the 2013 Enclave are a side blind zone alert and rear cross traffic alert, which use radar to watch spots the driver may not be able to see and provide visible and audible warnings to help prevent collisions. The 2013 Enclave goes on sale this Fall. The all-new 2014 Chevrolet Impala, the 10th generation this flagship sedan, is offered in LS, LT and LTZ models and goes on sale in early 2013 with a range of three direct-injected engines, including a 303 horsepower 3.6L V-6, new 195 horsepower 2.5L four-cylinder and a 182 horsepower 2.4L four-cylinder with eAssist expected to achieve 35 mpg on the highway. All of Impala’s engines are matched with six-speed automatic transmissions. General Motors reported total sales of 209,306 vehicles in February, up 1.1 percent compared with the company’s very strong February 2011 results. Year-to-date sales are 377,268, down 9.2 percent from the first three months of last year. Ford posted its best March U.S. sales month since 2007 with a sales total of 223,418 vehicles for March, a 5 percent gain over year-ago levels. For the first quarter, Ford Motor Company's sales were up 9 percent versus year-ago levels, totaling 539,247 vehicles sold. Toyota Motor Sales, U.S.A. reported its best March results since 2008 with sales of 203,282, an increase of 15.4 percent over the year-ago month. For the first quarter, TMS reported sales of 487,284 vehicles, an increase of 12.3 percent on an unadjusted raw volume basis. The Toyota Division posted March total sales of 183,142, an increase of 17.7 percent year-over-year. The Lexus Division reported total sales of 20,140, down 2.6 percent year-over-year. Chrysler reported U.S. sales of 163,381, a 34 percent increase compared with sales in March 2011, the best monthly sales in four years. Chrysler Group recorded its 24th-consecutive month of year-over-year sales gains and its 10th-consecutive month of sales increases of at least 20 percent. Year-to-date sales of 398,051 is a 36 percent increase over last year's first quarter. Nissan North America reported March U.S. sales of 136,317, an increase of 12.5 percent, and a record for any month in the company's history. Nissan Division sales also set a new sales record, up 14.8 percent for the month at 126,132 units. Sales of Infiniti vehicles were 10,185, down 9.8 percent from the prior year. American Honda reported March 2012 monthly new-vehicle sales of 126,999, a decrease of 8.4 percent over a strong March 2011. The Honda Division posted March 2012 sales of 115,833, a decrease of 7.7 percent year-over-year. The Acura Division's March sales totaled 11,166, down 14.6 percent compared to March 2011. Hyundai Motor America announced an all-time monthly sales record of 69,728, up 13 percent over last March, which held the previous record. For the first quarter, Hyundai sales were 163,573, up 15 percent over 2011. Kia Motors America had an all-time best monthly sales total of 57,505, a 30.2-percent increase over the same period in 2011.Year-to-date sales are 138,060, a 31.8 percent increase over last year. Volkswagen of America reported 36,588 units sold in March, a 34.6 percent increase over prior year sales and best March since 1973. Year-to-date VW has sold 94,373 vehicles, a 40.8 percent rise over the same period last year. Audi reported its 15th straight record-setting month of sales with 11,585 vehicles sold in March, an increase of 18 percent over March 2011. Year-over-year vehicle sales of 29,470 was a gain of 16.1 percent compared to 2011. 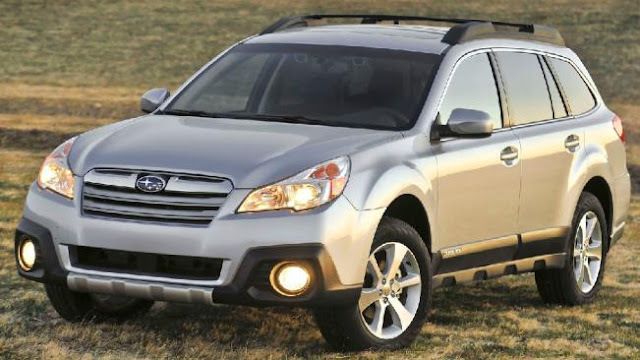 Subaru of America reported record sales for March 2012 of 32,387 vehicles, a 20.3 percent gain over March 2011. Year-to-date sales of 80,568 is a 19.4 percent gain over last year. March 2012 was the second best sales month in Subaru history, behind only December 2011. Mazda North American Operations reported March U.S. sales of 32,376 vehicles, representing an increase of 4.8 percent versus last year and best total month of sales since March 2008. Year-to-date sales of 82,023 through March are up 27.1 percent versus last year. The BMW Group in the U.S. (BMW and MINI combined) reported March sales of 29,806 vehicles, an increase of 13 percent from the same month a year ago. Year-to-date, the BMW Group (BMW and MINI combined) achieved its best first quarter sales since the record year of 2007 retailing 75,729 vehicles, up 16.6 percent compared vehicles sold in the first three months of 2011. 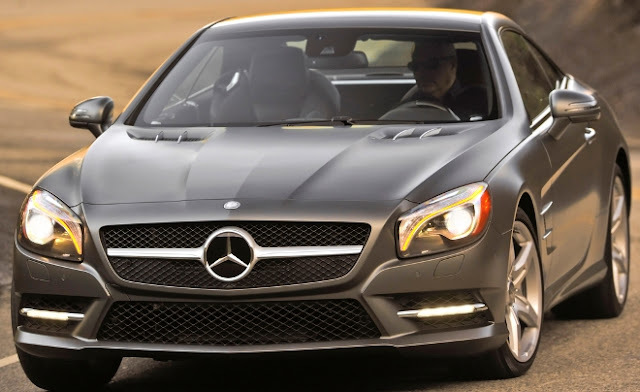 Mercedes-Benz USA reported a record March with sales of 23,134 for its Mercedes-Benz models, a 7.7 percent improvement over March 2011 leading to the highest first quarter volume on record with sales of 61,513, up 15.3 percent. Combined sales of Mercedes-Benz passenger vehicles, smart and Sprinter for the month totaled 25,508, up 13.1 percent, and for the year-to-date 66,906, up 19.5 percent. Jaguar Land Rover North America reported March 2012 sales: Land Rover sales for the month were 4,199 up 22 percent from 2011; Jaguar sales for the month were 1,321 up 51 percent from 2011; Jaguar Land Rover North America sales for the month were up 30 percent from 2011. Through the first three months of 2012 Jaguar Land Rover North America is up 29 percent. American Suzuki sales were 2,631 in March a gain of 5 percent over March 2011 and year-to-date sales are 6,561, a 2 percent decline from last year. Porsche Cars North America announced March sales of 2,460 vehicles, a five percent decrease from a year ago. For the year, Porsche has sold 7,159 cars in the U.S., which is a two percent increase over last year's sales. Mazda TAKERI Concept, the first Mazda concept vehicle to feature a SKYACTIV-D 2.2-liter clean diesel engine as well as other fuel-saving technologies such as i-stop, a stop-start system, and i-ELOOP, a regenerative braking system will make its North American debut in New York this week. 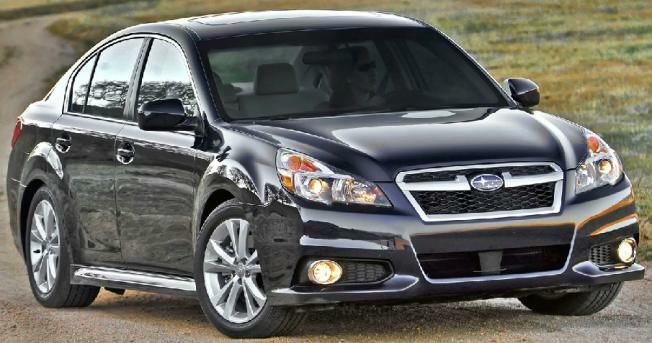 Subaru will debut the re-styled 2013 Subaru Legacy and 2013 Outback models this week at the 2012 New York International Auto Show offering either a 256-horsepower 3.6-liter H6 or a new 173 horsepower 2.5-liter four-cylinder powertrain with choice between a standard six-speed manual transmission and the second-generation Lineartronic CVT (continuously variable transmission) which Subaru projects will achieve 24 mpg city/32 mpg highway/27 mpg combined, compared to 23/31/26 for the 2012 model. Also new is an EyeSight driver-assist system which uses a stereo camera design developed by Subaru to provide a detection angle wider than that of radar-based systems and integrates Adaptive Cruise Control, Pre-Collision Braking and Vehicle Lane Departure Warning. The 2013 Subaru Legacy and Outback 2.5i is available in three trim levels – base, Premium, and Limited.